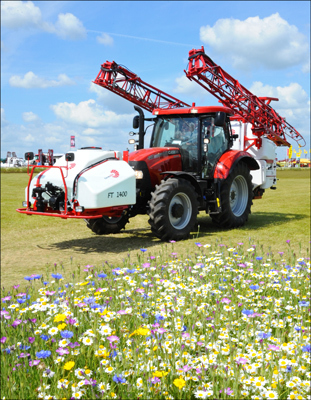 Wild flowers and hi tech spraying at Cereals 2014. As I write this there comes from a field to our rear the determined buzz of a hay crop being downed by a tractor and mower. This is only to be expected, it is mid June, the grass is well into its flowering phase and the weather is set fine for the rest of the week. Conditions are ideal and the farmers and many contractors of the area are making what they can of an opportunity that is in no way guaranteed as previous wet summers have only gone to remind us. The field itself is not particularly large, few are in this part of the world, maybe ten or twelve acres in total so the tractor will have come and gone in less than an hour with the crop felled and awaiting the next stage of the operation long before I have finished composing this post. Given such swiftness It is only too easy to reminisce about the good old days when such a job would have been a good morning’s work with an average tractor from the mid seventies or maybe a day or two when relying solely on a pair of horses to provide the power. But it wasn’t just the pace of the work that that was different, it was the connection with the land, the bonding with the soil that was so much more immediate when the time was available to tune in to the environment rather than concern oneself with the programming of the machines various electronic functions. This intimacy has been all but lost and to me it has robbed farming of the joy that a more youthful writer relished when working on the land, yet I would still be one of the last to wish for the return of archaic practices for the efficiency and speed with which agriculture conducts itself nowadays can only be of benefit in helping the world feed itself. My thoughts on this were strongly reinforced recently when I visited the Cereals event at Duxford in the UK. 25,000 farmers came to view all that was modern and up to date in the world of arable farming and to one who lives in a predominantly livestock area the advances that have been made over even such a short time frame as five years is quite remarkable. Auto guidance and yield mapping are well established tools, 12m combine headers are now mainstream, a minimum of 150hp, no, make that 200hp, is required to even think about cultivating the ground and if your telescopic handler doesn’t risk catching on the moon during those long harvest evenings then you are likely to attract nothing but scorn from your neighbours. Well, that’s what the exhibitors would have us believe anyway as they lay before us endless examples of shiny new equipment, but away from the all the latest gizzmo’s and engineering marvels there was another message emerging and one that is long overdue. The soil itself is now receiving the attention it deserves, not that it was ever completely ignored, the organic movement is not headed by an organisation called the ‘Soil Association’ without good reason. However, outside of this less intensive approach it was usually paid little more than lip service with an awareness that compaction was bad and drainage was good but hardly more than that as the attention was fully focused on what was happening above ground with plant breeding, fertilizer regimes and pesticide use being the stars of the show when it came to yield increases. Two developments have started to change this attitude though, the first is the yield plateau where no matter what agronomy is deployed the increases in production are minimal while the second is the greater use of minimal cultivation which can reduce tillage costs quite considerably but, as it is now being appreciated, requires a far greater understanding of soil dynamics, including the encouragement of its fauna, to be exploited to the full. This refreshing shift in emphasis from who has the biggest baddest tractor (although that, by no means, has totally gone away) to who best understands the requirements of the soil and how to attend to them was, to me at least, the most noticeable feature of this years show and it is encouraging to see that the it is an area of growth dominated by smaller businesses rather than the large corporations who naturally have their own agenda which may not always coincide with the interests of the grower. The loss of that connection to the soil that I earlier lamented may well be reestablishing itself but in a far more scientific way, which is good for productivity but will hardly inspire the poets. This entry was posted in Uncategorized on June 19, 2014 by Triplemanr.